Bigasoft DVD to iMovie Converter for Mac is a well designed DVD to iMovie converter to import DVD into iMovie with amazing speed and excellent quality. With Bigasoft DVD to iMovie converter, you can easily import DVD to iMovie by converting any DVD to iMovie compatible video formats such as MPEG4, QuickTime MOV with ease. Besides, it can extract the audio track from DVD and then convert it to iMovie supported audio formats like MP3, WAV, AAC, and M4A. Moreover, you can freely select target subtitle and audio track, customize file size, rip only the parts of the movie you want, capture your preferred pictures on the DVD, merge several files into one file, convert DVD in batches, crop DVD, and more. Bigasoft DVD to iMovie Converter can help you easily rip DVD to iMovie compatible video MP4, MOV format with high speed and great quality. You are able to extract any audio you like from your DVD and save as MP3, WAV, AAC and M4A format. The wonderful DVD to iMovie converter provides you with adjustable video and audio settings such as resolution, frame rate, video bit rate, audio bit rate, sample rate and so on. The converter helps to adjust the playing region of the DVD to fit as you like. You can convert certain segment of the DVD by setting the start time and end time with the smart DVD iMovie converter. With the user-friendly interface, the DVD ripper for iMovie is suited for both veterans and beginners. The conversion is that easy. Multiple languages are available including English, German, French, Spanish, Japanese, Arabic, Chinese, and more. 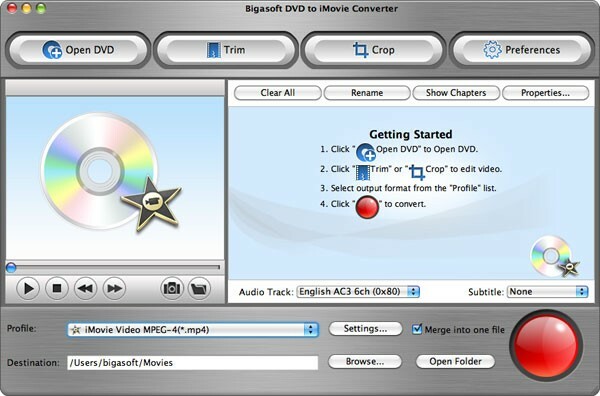 Bigasoft DVD to iMovie converter is fully compatible with Mac OS X 10.4(Tiger), 10.5(Leopard), and 10.6(Snow Leopard). Soft4Boost Video to Device - Soft4Boost Video to Device is a reliable wizard-styled video converter. Convert easily your favorite video for any portable device. Soft4Boost Video to Device will do all the conversion job for you with just several mouse clicks. Tipard DVD Ripper Pack - Tipard DVD Ripper Pack contains several powerful software: DVD Ripper, Video Converter and iPhone Transfer Platinum, which can rip DVD and convert videos to MP4, MOV, AVI, WMV, FLV, MKV, M4V, etc. and transfer iPhone data to PC and iTunes for backup. 4Videosoft Blu-Ray Ripper - You can use 4Videosoft Blu-ray Ripper to convert Blu-ray disc to any popular video and audio formats easily. It has a strong editing functions. It can support many devices such as HTC One X, HTC Butterfly, Samsung Galaxy S4, Note II, Tab 2 7.0 etc. MacX iTunes DVD Ripper - MacX iTunes DVD Ripper is the best DVD to iTunes video converter software that can rip DVD movies into iTunes and Apple TV supported formats, MP4, MOV, M4V, MP3 with sharp picture and original video audio quality. Tipard DVD to MP4 Converter - Tipard DVD to MP4 Converter can rip DVD disc to MP4, AVI, MOV and other video formats. It can also extract audio from DVD, and then convert them to AAC, WAV, etc. Thus, you can enjoy them on iPhone 6s/6s Plus, iPhone 6/6 Plus, iPad mini 4/3, etc. Tipard DVD Ripper - Tipard DVD Ripper can convert DVD disc/folder/ISO file to MP4, AVI, MKV, WMV, MOV, M4V and so on. Meanwhile, it can convert your DVD movie into HD MP4, HD H.264, HD AVI, HD MKV, HD TS and more. It is compatible with windows 10. Tipard Total Media Converter for Mac - Tipard Total Media Converter for Mac is able to rip DVD disc, DVD Folder and ISO image files to MP4, MOV, M4V, MKV, AVI, WMV, TS and other videos for Mac. Meanwhile, it can also convert 2D video formats to 3D video formats. Sothink DVD Ripper - Sothink DVD Ripper is the all-inclusive DVD ripper software, which rips and coverts all the DVD discs, folders and ISO files into correct video or audio formats for playback on various mobile and portable devices.